Thermo-Lock™ is the ultimate in sound and heat energy management for your hot tub. The unique thermal barrier technology recycles radiant heat energy for faster, more efficient heating and energy cost reductions. 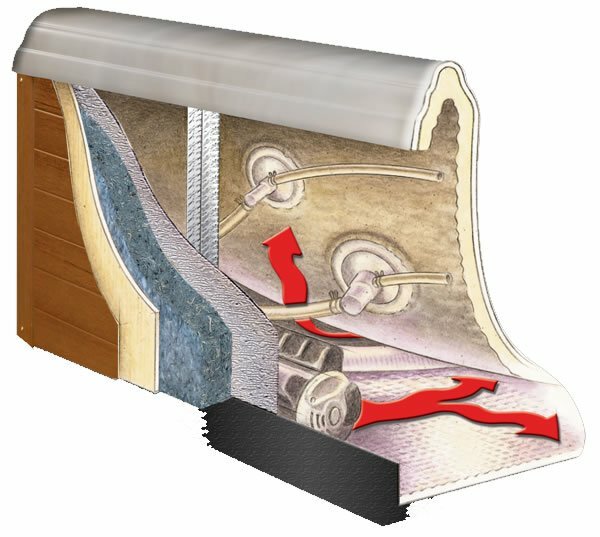 Radiant heat reflective insulation is applied to the sealed ABS base, which prohibits heat loss through the floor. All four sides, plus the floor are lined with reflective material, combined with BlueMAAX® to create an infrared thermal barrier. Radiant heat energy from the pumps and equipment reflects back to the spa and is absorbed into the plumbing. This helps raise and maintain water temperature, improving heat efficiency. Energy created by the spa stays in the spa.